There are some other open source transmitter projects, so why did I start another one? Enough about blocks:-) Let’t go to other topics. That’s another cool solution here: multitasking in AVR! After copying output values to buffer for generating PPM, CPU starts getting analog values from ADCs (using interrupts). They are filtered and recalculated and results are put in input channels. Meantime 2 thing are running: PPM generation using interrups and user interface or other not critical things. When all values from inputs are ready, a task switch occurs. User interface thread is interrupted, state is saved to ram and block calculation task begins. After processing and calculating all blocks, this task ends and switches back to user interface task. Great advantage of multitasking is that during programming user interface I could do whatever I want without bothering myself about timing as long as interrupts are enabled. I decided to use internal flash memory as main storage for model definitions (blocks, initial channel values etc.). I organized data into containers with headers containing information about model number, contents of container (block, channel, comment…) and length. And one important rule: there could be many containers with the same ‘id’ but only last in memory is valid. It makes updates as simple as writing new version of container at the end of other containers. It also help to reduce flash write/erase cycles. Only drawback is that memody should be compacted from time to time. But using trims could fill all flash memory very fast, so I decided to make temporary storage only for channels (4 bytes/ch) in eeprom. In future there will be possibility to move values from eeprom back to flash. It will be needed to backup/restore model definitions. Somewhere between 2007 and 2008, during discussion on Alexrc forum, idea of very flexible and fully programmable transmitter were born. 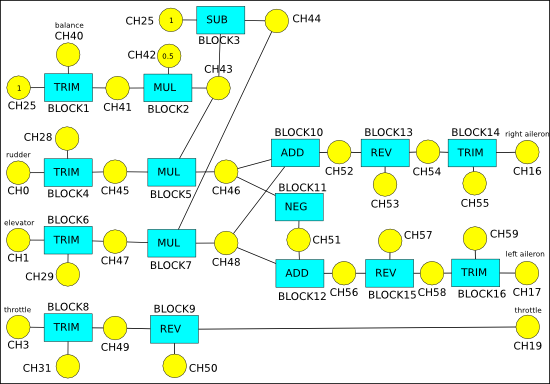 Idea was to define model inside transmitter using basic blocks (sum, multiply etc) and connections between inputs, blocks and outputs. In 2008 I made a universal board for my projects using Atmega8L and LCD screen from Siemens S65 phone. At the end of 2009 I had some things finished: generating ppm, calculating blocks and basics of user interface (menu, keyboard). And then project stuck for almost 3 years. I tried to make it too universal, and it didn’t worked for UI. During these years I used simple transmitters – there were enough for my planes. But at the end Tricopter appeared:-) Problems with arming control board and need for more channels resurrected old project. So, at the end od 2012 i removed some code (mostly UI related), revised some assumption (store model definitions not only in flash, but also use eeprom for this), and project moved forward. Because right now there is almost impossible to buy S65 LCD display (but I have few 🙂 ), I bought another similar one. Plan is to make code supporting also this new display. Hello, nice transmitter 🙂 I especially like the awesome mixer-setup-interface. I am making something similar using Mega168/328 with GCC ( not Arduino ). I have managed to get PPM input and output using CTC and 1 compare match from Timer1 only, it is completely interrupt driven and runs fine even at 20 MHz. I am about to start implementing my “black box” of mixers. 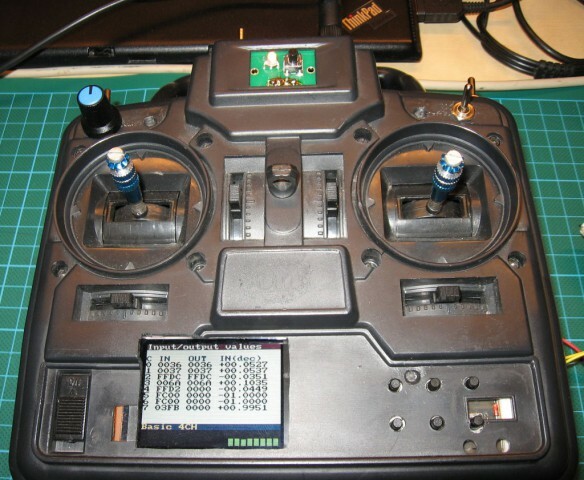 Mostly this project was started due to the inability to use both Delta and Differential mixers on my Graupner MC12. The first version will be a small PCB that connects the output PPM ( student out ) to the input PPM ( student in ) on the same transmitter. This will give me the nice option to bypass my pcb with the student-switch and I can use my normal TX for testing, no need to build a complete transmitter ( yet ). When all the PPM-stuff is OK I might add sticks, knobs switches and some display but I`ll probably move to Cortex M3, I have some NXP-boards floating around. Any chance of finding your sourcecode somewhere? My code is managed in git, it´s not so pretty but I´ll be happy to share, perhaps you´ll find the timer1 ppm implementation interesting or useful. 3. Keep in mind that interrupt can’t be executed always in exact time (some instructions last longer, some are shorter, some block cpu (eeprom access), sometimes you have to wait for another interrupt to complete). If you use PWM output and program counters before generation, it’s fine. But if you use counter to make interrupt and you toggle pwm output there, you get some delay (not constant) between cause of interrupt and result. 5. Regarding 20MHz – it’s a lot of time to do many things:-) I encountered not enough ‘power’ in only 2 cases: drawing on lcd screen (spi could run faster 😉 ) and video overlay generation (in OSD). Anyway, it’s fun to make such things, but it also require patience and lot of effort to finish it – transmitter is quite complicated thing. In my case making ppm, tasks, ‘black box’ was fun, but whole user interface is just a ‘need to finish/work’. Good luck wih your project! Panie Marku czy Pana projekt był kiedyś przepisany na platformę Arduino? Hardware, to dokładnie najmniejsze, najprostsze i najtańsze Arduino. – baaardzo zmalałaby pamięć na modele, bo sam kod byłby większy, a obawiam się, że nawet mógłby się nie zmieścić w Atmega328. Wtedy całe założenie, że ma być tanio i dobrze nie będzie już spełnione. Natomiast niedługo pojawi się inny bootloader (modyfikacja Optiboota), więc łatwiej będzie wgrywać nowy soft (używając avrdude zamiast tajemniczych komend z minicoma). Docelowo ma być również dostępny eksport/import modeli jak i ich modyfikacja w aparaturze, więc wtedy nie będzie potrzebna kompilacja przy każdej zmianie – wystarczy raz wgrać hex-a.